This is one piece of 8 inch chess set. Usually use for indoor game with friend and partner; in living room, patio area, office, hotel, school, and another place. You just need flat board and stand up the chess pieces on it then the game can started. This kind of chess set is easy to carry and simple. So you can bring it anywhere you want to play. A chess set consist of 32 pieces, just put it in your suitcase with the board and you can carrying now. Made from best quality of Teak wood and carved beautiful by our expert craftsman. Polished well in black color with glossy touch, make it looks sophisticated. Perfect for your indoor chess game in your rest time. Get it now! We provide various kind of wooden chess size. 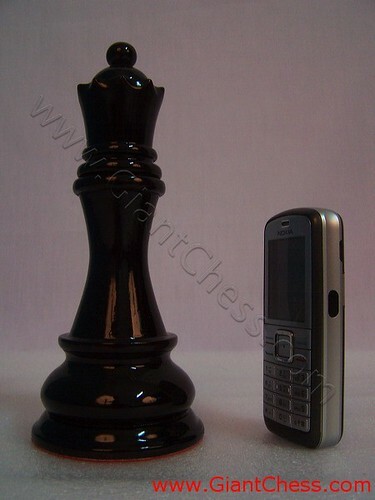 Beside 8 inch, we also have 12 inch, 16 inch, 24 inch till the giant chess piece of 72 inch. The giant chess piece is perfect for outdoor chess game.